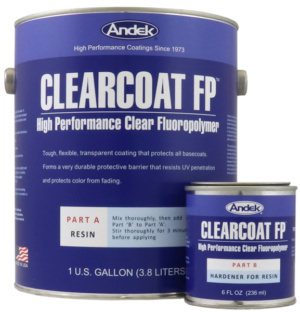 CLEARCOAT FP is a tough, flexible, transparent coating that protects all basecoats. It forms a protective barrier that resists U.V. penetration and protects the colors from fading. It extends the lifespan of the substrate by protecting it from oxidation, corrosion and infiltration by free radicals. CLEARCOAT FP is a two component coating. Its exceptional toughness and flexibility is the result of the reaction between a fluoropolymer resin and a polyurethane hardener prior to application. Protects colors from fading. Keeps white bright. Maintains surface texture, gloss and appearance. Resists dirt retention, staining and discoloration. High abrasion and damage resistance. Low friction. Excellent mechanical strength, toughness and flexibility. Surface resists fungal growth and microbiological deterioration. High electrical resistivity protects metallics from tarnishing. Low VOC, low odor during application. Extends the useful lifespan of protective coatings. Can be used over acrylic coatings, metallic finishes, polyurethanes and many types of protective and decorative coatings to preserve their appearance. May also be used over many types of plastics including PVC, TPO, EVA, ABS, CPE, CSPE as well as plastic/rubber alloys to preserve and protect their appearance and function. All surfaces to be coated must be clean, dry, and completely free of loose particles, grease, oil, or any substance that would interfere with proper bond. 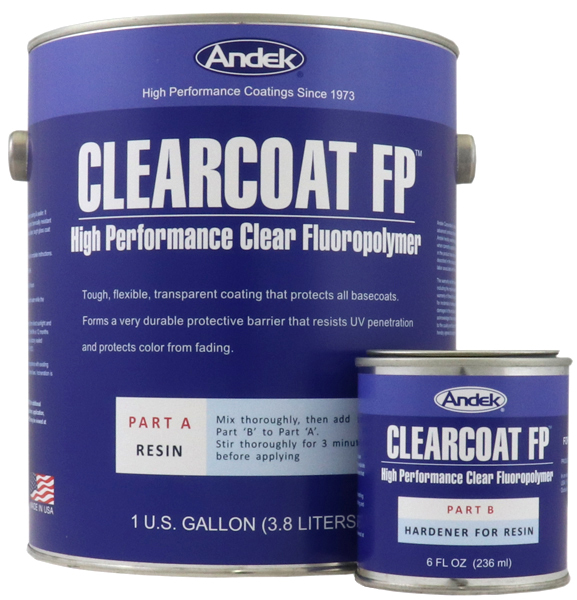 CLEARCOAT FP Hardener container should be emptied into the CLEARCOAT FP resin & stirred for 3 minutes, then allowed to sit for 10 minutes or as long as necessary for all air to escape. CLEARCOAT FP may be applied over products such as Polafloor AC after the Polaroof AC has been thoroughly dry for at least 24 hours. If overcoating a painted surface, check compatibility first, as some paints may bleed color. CLEARCOAT FP may be applied by brush or airless spray technique in a thin, even coat. Care should be taken to avoid creating foam or trapping air bubbles which may later result in pinholes or hazing. If traction enhancement is required, iron-free sharp white quartz sand or AsperGrit Plastic Granules may be broadcast into the wet CLEARCOAT FP. After the first coat has thoroughly dried with the embedded grit, a second coat of CLEARCOAT FP is applied to thoroughly encapsulate the aggregate. Sized and graded sharp white quartz sand and AsperGrit are available from Andek Corporation. Do not use below 40°F. Do not apply if the application cannot be protected from precipitation for 4 hours. Shelf life is 12 months when stored in proprietary containers between 45°F and 95°F.